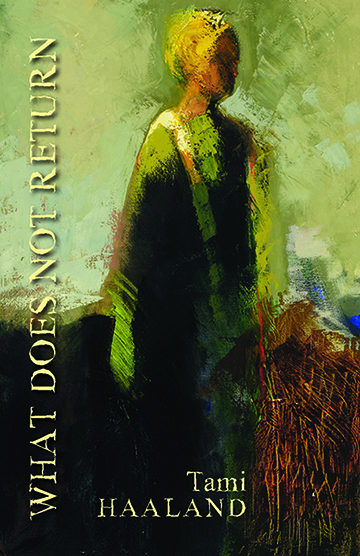 Tami Haaland’s exquisite and necessary book of poems, What Does Not Return, is a rare account of the experience we have come to call, rightly, care-giving. With ritual attentiveness, in small, deeply considered gestures, in words exchanged at the altar of grief, she shows us what it might mean to honor and celebrate what is given to us and what is taken away. From the moving first poems, in which she witnesses her mother’s daily diminishment and eventual death from dementia, to the last, when she finds herself searching silently for an escaped rabbit in the night, these poems remind us that, if we are here, we are all “graveside,” sitting “on the edge, legs dangling.” We are here on the verge of tears, where the daylight is. Tami Haaland is the author of three poetry collections, What Does Not Return, When We Wake in the Night, and Breath in Every Room, winner of the Nicholas Roerich First Book Award, and her work has appeared in High Desert Journal, Consequence, Ascent, The Ecopoetry Anthology and many other periodicals and anthologies. Her poems have also been featured on The Writer’s Almanac, Verse Daily, and American Life in Poetry. She received an Artist Innovation Award from Montana Arts Council and is a 2019 recipient of a Governor’s Humanities Award. Haaland has served as Montana's Poet Laureate and teaches at Montana State University Billings. Henrietta Goodman is the author of All That Held Us, published in 2018 as winner of the John Ciardi Prize from BkMk Press at the University of Missouri. Her first book, Take What You Want, won the Beatrice Hawley Award from Alice James Books and was published in 2007; her second book, Hungry Moon, was published in 2013 by the Mountain West Poetry Series at Colorado State University. She has received grants and residencies from the Montana Arts Council, the Atlantic Center for the Arts, the Boyden Wilderness Writing Residency, Fishtrap, and the Kimmel Harding Nelson Center. Her poems and essays have recently been featured on Poetry Daily and Verse Daily, and published in New England Review, Mid-American Review, Gulf Coast, Field, Guernica, Massachusetts Review, 32 Poems, and other journals. She lives in Missoula.